A lot has already been said about Bentley’s new SUV, the Bentayga. Some have called it a new high for the brand, praising the new car to heights it cannot hope to reach, even with four-wheel drive. Others have called the Bentayga a low for Bentley, questioning how the brand has been able to sink so deep. The fact of the matter is that many of the people criticizing the Bentayga have been complaining about almost everything Bentley has done since it was taken over by Volkswagen. To some extent this is understandable. Although an icon of the automobile industry, Bentley has not fully lived up to its potential since it was bought by Rolls-Royce in 1931. Part of the problem was that the brand lacked the resources to position Bentley in a differentiated manner from Rolls-Royce, so for decades there were (too) many similarities between the two brands, with Bentley positioned only slightly more driver-oriented. Nevertheless, Bentley was always a formidable car. Slightly conservative, but that element was actually appreciated by its old-money clients. When Volkswagen took over Bentley in 1997, it had the resources to set the marque apart from its former sister brand and it committed to this without hesitation. But in a capitalistic world, such investments need to render revenue to be justified. So Bentley cleverly designed cars that would appeal to a new clientele while at the same time remaining true enough to the existing client base. The Continental GT is a prime example of this: it is a formidable coupé with powerful lines that are classic Bentley. In British Racing Green with Tobacco leather, it remained the perfect choice for any aristocrat, but in Orange Flame with black rims and carbon fiber instead of walnut veneer, it also openly flirted with a whole new group of potential customers. 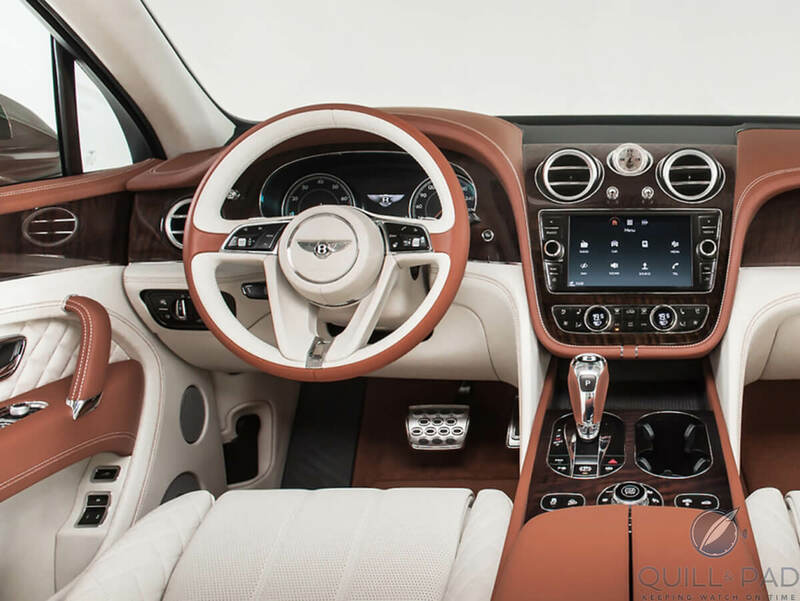 And it was for those prospective clients that Bentley created the Bentayga as the ultimate SUV. It’s the SUV for those who find the Lamborghini LM-002 too vintage, the Porsche Cayenne too common (wouldn’t we all with 73,119 examples produced in 2015 alone? ), the Range Rover Autobiography too old-fashioned, the Maserati Levante (see Maserati Levante: A New Italian SUV Roars In The Urban Jungle) too small and underpowered, and the Mercedes-AMG 65 looking too much like a tractor. But can it go off road? What they will get for the almost a quarter of a million base price can indeed qualify as the ultimate SUV (or at least their version of it): the 6-liter W12 engine delivers 600 horsepower at 6,000 rpm, but that is not the most impressive number; the 900+ Newton-meters (664 pound-foot) torque at 1,350 rpm (!!) is! Thanks to this, the Bentayga only needs four seconds to go from 0 to 100 kilometers per hour (60 miles per hour) at which point it will continue to joyfully accelerate up to its top speed of 301 kilometers per hour (187 miles per hour). If you are wondering about the fuel economy as the Bentayga joyfully accelerates, that’s not likely to be a concern to those who enter the Bentley showroom to buy one. What they do find important is that the Bentayga weighs 250 kilograms (550 pounds) less than the Mulsanne. This of course does not make the car a featherweight champion, but at nearly 2,450 kilograms / 5,400 pounds the car is agile – also thanks to its multilink front and rear suspension, which makes the Bentley an impressive Autobahn predator with only true supercars posing a threat. The big question is, of course, can it go off road? Yes, it can and it actually does a pretty decent job. The limiting factor will most likely be the tires because doing 0-100 kilometers per hour in four seconds flat on an asphalt road as you attempt to drive up the 1,414-meter (4,642-foot) Bentayga mountain peak situated on Spain’s Gran Canaria for which the Bentayga was named would ideally require different rubber for top performance. But how often will Bentayga owners really drive off the blacktop? They might run the risk of damaging their paint job, which can get expensive, especially when they opted for one of the $5,715 extra-cost paints. Which is, by the way, only the beginning of an extensive list of options featuring a pair of removable tablets for back seat passengers ($7,155), a full replacement of the stunning wood trim in favor of carbon fiber ($28,500), and $30,000 for a picnic basket and trunk seat to watch a polo match in style. Quill & Pad’s favorite option is, however, of course the most expensive one. As the official watch manufacturer for Bentley, Breitling had the honor of making a very special clock for the Bentayga. And the Swiss brand has really outdone itself, fitting the clock with a time-only automatic tourbillon movement and diamond-set hour markers, making this a $160,000 option. For that (almost obscene) amount of money you get a one-minute flying tourbillon in a titanium case featuring a dial in either black or white mother-of-pearl set with eight diamond hour markers. This movement is housed in an 18-karat gold case – your pick of white or yellow. As ridiculous as the price may seem to so many of us, the clock actually makes sense. The tourbillon will spend most of its time in more or less the same vertical position, actually actively contributing to the precision of the movement. And, yes, it’s automatic: a clever electric winder rotates the entire clock to ensure sufficient power reserve. Thanks to two spring barrels the power reserve is 50 hours, good to know when you have a dead battery and are waiting for Triple A to arrive. The clock even has a display back, and the rotor is crafted in such a way that it has a cutaway over the position where the tourbillon is located, so that light can enter from behind to maximize the effect of its mechanical beauty. It’s just one of those touches that really set the Bentayga apart from all other SUVs. Of course at a generous cost, but for those who can and will buy the car that is not really a problem. They can afford it, not only in a financial sense, but also in a social one. They are most likely self-made or have parents who are self-made, as a result they live and purchase their products in a totally different way to most of us, and Bentley knows that and meets their demands. Bentley expects to build 5,500 Bentaygas in 2016. Is the carmaker being too optimistic about the potential of the newest addition to the line? Based on incoming orders the number originally set has already been raised. When you realize that last year Bentley made just north of 10,000 cars you understand the significance of this number as well as the importance of this clientele to the company. So what about the prospective old money buyers? Well, Queen Elizabeth II is still very content with her Land Rover Defender. For those others looking for more luxury, the Range Rover offers the same type of luxury as the Bentley (minus the Breitling Tourbillon) and might look less out of place when you park it in front of your manor. For more information, please visit www.bentayga.bentleymotors.com/en/bentayga.